Types of Knee Braces How Much Support Do You Need? What Does a Knee Brace Do? What Does the Research Show? A knee injury can be a painful and scary experience. You may notice that knee pain can limit your ability to walk, work, and participate fully in recreational activity. You may require physical therapy to help improve range of motion and strength and decrease pain after a knee injury. If you have injured your knee, you may wonder if a knee brace is a right device for you. There is some controversy over the use of knee braces for knee pain or osteoarthritis. A brace may limit the mobility of your knee and kneecap. While doing so, the muscles and tendons that support your knee do not have to work, and therefore they may become weakened. This can limit their ability to work properly when the knee brace is not being worn, leading to further injury and functional loss in the knee. 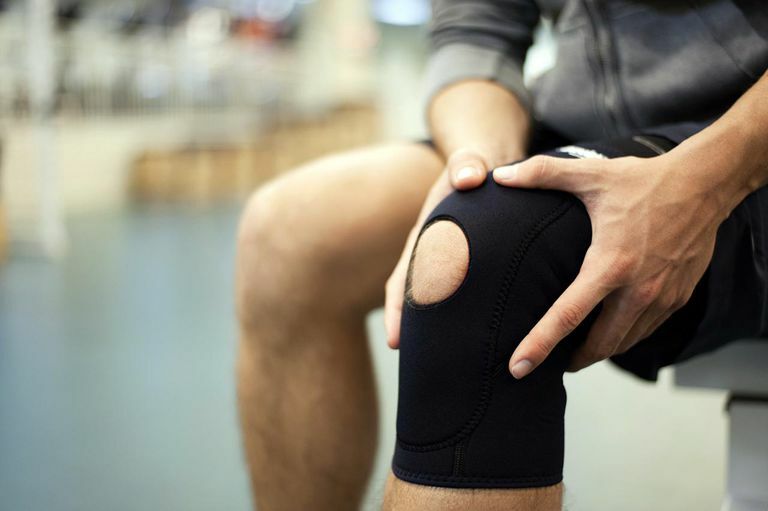 Knee immobilizer: A knee immobilizer is a brace that does exactly what its name implies: it immobilizes the knee joint and prevents it from moving. It is a long cloth brace that extends the length of the shin and thigh. There are metal support struts on the inside and outside part of the brace. Velcro straps hold the knee immobilized in place. If you suffer a fracture of the patella or upper shin bone, a knee immobilizer may be used to help keep things in place during healing. The benefit of an immobilizer as compared to a plaster cast is that it can be removed to allow a gentle motion to occur during healing. A knee immobilizer may also be used after ligament or tendon injury or surgery around the knee. It can help keep the knee straight to allow proper healing to occur, but it can also be removed for a gentle motion to occur. Be sure to speak with your doctor or physical therapist to be certain that it is safe before removing your knee immobilizer. Bledsoe brace: A Bledsoe brace is commonly used to stabilize the knee after surgery. The brace is most often prescribed after ACL surgery. It has straps that wrap around the thigh and shin and metal support brackets on the inside and outside part of the knee joint. There is a small locking mechanism that can lock the knee into full extension (straightening), or the mechanism can be unlocked to allow the knee to bend a specified amount. After ACL surgery, your doctor will tell you at which setting to keep the joint lock. Initially, the lock is kept in full extension to protect the healing ligament. As healing occurs and more stress is allowed on the ligament, the locking mechanism may be changed to allow the knee to bend to a specific range. Be sure to consult with your doctor or physical therapist before making any changes to your Bledsoe brace. Patella control brace: A patella control brace is a neoprene sleeve worn over the knee. It has a cutout that exposes the patella and it serves to hold the patella in the proper place during activities like walking, running, or squatting. If you have suffered a dislocated patella, the patella control brace is a good option to help keep the patella in the proper position. Other conditions like patellofemoral stress syndrome, knee arthritis, or chondromalacia patella (CMP) may also benefit from the use of a patella control brace. Be sure to talk to your physical therapist or doctor to be sure you are using the correct brace for your condition. Motion control brace: If you have sprained or overstretched the ligaments on the side of your knee (namely the medial collateral or lateral collateral ligament), a motion control brace may be a good option for you. This brace is a neoprene sleeve with metal supports on the inside and outside that help support the ligaments there. It is a good brace to use for athletic activity that requires pivoting, stopping and starting or repetitive bending of the knee. Light support. These braces may include patellar bracing straps, Cho-Pat straps, and neoprene knee sleeves. They allow for maximal motion around your knee and provide a minimal knee joint control and stability. These are typically used for conditions that are mild, including for tendonitis, patellofemoral stress syndrome, and chondromalacia patellae (CMP). Moderate support. Braces that are articulated with metal stays on either side or with significant strapping provide moderated knee joint support. These may include patellar control braces or a motion control brace. An osteoarthritis knee unloader brace also provides a moderate level of support. These braces control motion around your knee, but still allow for some mobility and are perfect for using during athletic participation after an injury. Total knee joint support and control. After knee surgery or injury, you may require full immobilization of your knee. In this case, a knee immobilizer brace is used. A Bledsoe brace can also be used to immobilize your knee. The Bledsoe brace allows you to unlock it, giving you some freedom of motion as things are healing. What Does a Knee Brace Do? Patellar dislocation. If you have suffered a dislocated patella (kneecap), a brace can help keep the patella in the right place during walking, running and athletic activity. A patellar control brace should be used for this condition. Anterior cruciate ligament sprain. After knee surgery like a meniscus repair or an anterior cruciate ligament (ACL) repair, a knee brace may help stabilize the joint. Initially, after surgery, a Bledsoe brace is worn. After some healing has taken place, a motion stabilizing brace can be worn during athletic activity. After fracture. A brace may be used on your knee if you have suffered a fracture. This may be used in place of a cast, allowing for some gentle motion to take place as your fracture is healing. The type of brace used after fracture is a knee immobilizer. Patellar Tendonitis and chondromalacia patellae (CMP). Patellar tendonitis is a painful condition in the front of your knee. Many patients with this condition benefit from a patellar motion control brace with a J-pad in the front to gently lift the patella. Iliotibial band stress syndrome. Iliotibial band stress syndrome causes pain on the side of your knee. Some patients benefit from using a small Cho-Pat band around the lower part of the knee joint. The band helps to compress the iliotibial band where it inserts into your shin, decreasing the mechanical forces acting upon it. Arthritis. People with knee osteoarthritis sometimes benefit from an OA adjuster brace. This helps to unload the joint surfaces of your knee. In general, a knee brace should be specific for your condition and should help to manage and distribute forces around your knee. After an injury, a brace can protect your knee and the surrounding structures as healing takes place. When considering any medical treatment or test, you should have a basic understanding of what the research shows. There are several different studies about the effect of various knee braces for osteoarthritis or for injuries. A recent meta-analysis examined the effect of a special valgus unloader brace for knee osteoarthritis. The researchers included 6 different studies in the analysis and concluded that the brace can lead to small to moderate improvements in pain. Compliance was an issue, though, with use ranging from 45-100%. About 25% of patients reported minor complications or problems with using their brace. Another study simply asked, "Do patients actually wear their knee brace?" They interviewed 89 patients with osteoarthritis who were prescribed a brace. They found that about 28% of the patients used their knee brace one year after being prescribed the brace. Does this mean that you will experience the same problems with your brace? Not necessarily. It helps to simply have an understanding of reasons why people stop using their knee brace. If you have injured your knee or have had surgery on your knee, a brace may help provide support and motion control during functional activity. Remember that a brace may lead to misuse of the muscles of the leg. Therefore it is recommended that you maintain strength by performing knee strengthening, hip strengthening, and ankle strengthening exercises. It is also important that the brace is fitted and worn properly to get maximum benefit from the brace and to avoid further injury from improperly using your brace. Most importantly, the use of a knee brace should be discussed with your doctor and physical therapist. Both of these practitioners can evaluate your knee and help decide if you should use a knee brace. Your physical therapist and doctor can also work together to help determine the best knee brace for your specific condition. Moyer, RF, etal. Valgus Bracing for Knee Osteoarthritis: A Meta-Analysis of Randomized Trials. Arthritis Care and Research. 67(4), March 2015. Safran, M., Stone, D., & Zachazewski, J. (2003). Instructions for Sports Medicine Patients. Philadelphia: Saunders. Squyer, E, etal. Unloader Knee Braces for Osteoarthritis: Do Patients Actually Wear Them? Clinical Ortho and Related Research: 471(6). June 2013: 1982-91.